Want to judge a person's socioeconomic status? 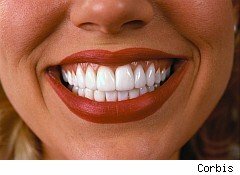 Check his or her teeth. There is still a wide disparity in our access to dentistry. A recent study by Men's Healthranks America's communities for their tooth health. How did it come to this conclusion? By crunching databases of dentist visits, procedures, flossing, money spent on tooth health products, water fluoridation and dentists per capita. Not all health coverage plans include dental insurance, of course. In 2001, the CDC found that while 86.19% of those surveyed had some form of health insurance, only 61.02% had dental coverage. You'll note quite a bit of overlap between those communities with uninsured residents and those who haven't visited a dentist. Of all the factors that determine tooth health, this is probably the most difficult to change. In the era of $700+ crowns, those without insurance would be well advised to brush, brush, brush and floss, floss, floss, so you won't have to spend, spend, spend on your dental health.